23 year old Ewen was a Locomotive Driver for the NSW Government Railways and Tramways. He was born in 1891 in the very small country town of Brewarrina near Bourke NSW. His father was Ewen Fergus MacPherson and mother Genevieve Louise (nee Lord MacHattie). Both his mother and father had came from prominant military and influental pioneering families, and maintained a proud connection to the ancient Scottish clans. Ewan descended from a line of fighting scots and military men, and now being the eldest son of a very large family he continued to carry on their name. His great grandfather Ewen, was a “red coat” a Major with 99th foot regiment, a colonial military officer who was a member of the British regiments attached to the colonisation of Australia. He had had fought in the Maori wars in New Zealand and was nearly fatally wounded, was posted in Norfollk Island and was later appointed a magistrate of the growing Illawarra district and in charge of the convict stockade in the 1840’s and later promoted to Lieut Colonel. 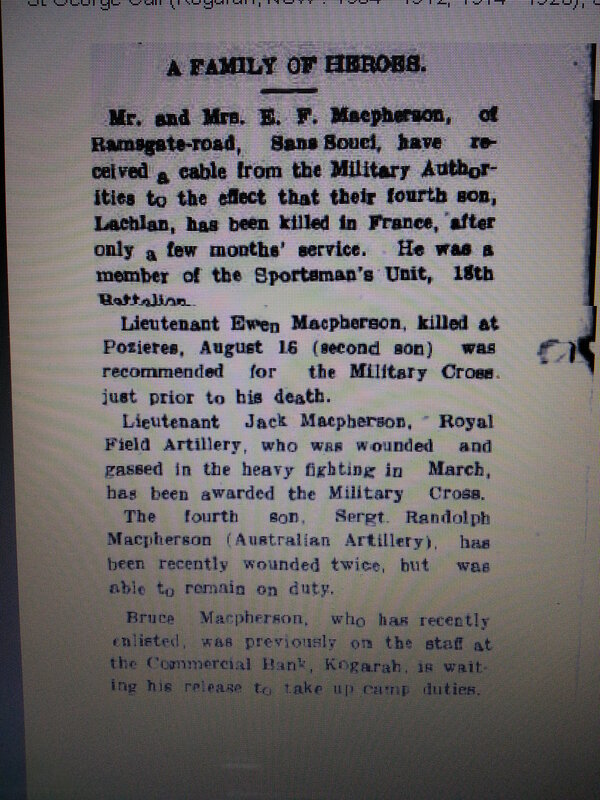 Ewen’s grandfather was Captain Ewen Macpherson, a volunteer in the artillery in Newcastle. His great grandfather on his maternal side was the Honourable Francis Lord MLC a prominant North Shore councillor and descendant of a wealthy settler family, and his Aunty Mary MacPherson had married Alfred Cox a very wealthy pastoralist, a New Zealand Member of Parliament and also just so happened to be the son of well known Australian explorer and pastoralist William Cox. Ewan had a quite a reputable family military history and an extensive family background to live up to. He was the eldest in a large family of brothers and sisters. Three of his brothers old enough to enlist very likely felt the same pressure of duty, family tradition, and civic responsibility. The family of heroes as they later became known would make the ultimate sacrifices and two sons would never return. There is some uncertainty as to his service at Gallipoli, he was a driver and initially it looks like he spent his time at Egypt, however he may have been involved in the launching of the pontoons on the NIZAM. He had a bad case of appendicitis which required surgery and quite some time was spent in recovery. He was transferred from Alexandria to London and admitted with severe Myalgia on late August 1915. Ewen had his appendix removed 29th August 1915 and while recovering he applied for and obtained a commission with the British Imperial Army and was discharged from the AIF 11/11/15. This was not an unusual step for many men who felt they were perhaps underutilized and wanted to see more field action or in Ewen’s case he may have wanted to be by his brother’s side. His brother John had also transferred to the British Army and was also with the Royal Artlillery. He was discharged from the AIF and obtained a commission with Imperial Army in the Royal Horse and Royal Field Artillery Special Reserve on the 6th Dec 1915 as 2nd Lieutenant. Ewen was killed in action on the 10th August 1916, Ypres, as stated on the Death certificate from the London war office. The circumstances of his death were later published in a letter from an officer who notified his family, with the dedication “Passing of a Hero”, the transcript follows…..
BRAVE ENDING OF A GALLANT LIFE. To the long list of brave men who have offered their lives for the Empire is Lieutenant Ewen Lord Macpherson, a grandson of the late Mr. Randolph Machattie who was in the landing at Gallipoli Peninsula, and having been invalided to England rejoined the army at Ypres recently with a commission in the Royal Field Artillery. This young officer lost his life on the 10th of August in the heavy fighting that took place near Ypres— and the following letter from the officer commanding his brigade has been received buy his parents. Two of the dead hero’s brothers are now fighting at the front. Gordon Dump Cemetery is 2 kilometres north-east of Albert, on the right hand side of D929 Albert-Bapaume. The Macpherson’s a “Family of heroes” as they later became known would make the ultimate sacrifice and two sons would never return. Ewens brother 7017 Pte Lachlan Charles Lord MACPHERSON of the 18th Batallion was killed in action two years later on the 29 August 1918. His other brothers John and Randolph would all return home safely, his younger brother John continued to serve in the Royal Artillery with great distinction and was honoured by Britain and France. LIEUT. J. M. L. MACPHERSON M. C., C. de G.
1.Brothers: 7017 Pte Lachlan Charles Lord MACPHERSON, 18th Bn, killed in action, 29 August 1918;  2nd Lt Ewen Fergus Lord MACPHERSON, 5th Brigade, Royal Field Artillery, killed in action, 10 August 1916;  Lt John Machattie Lord MACPHERSON, Royal Field Artillery and Sergeant Randolph G. L. Macpherson, of the 26th Battery, 7th F.A.B. 2. 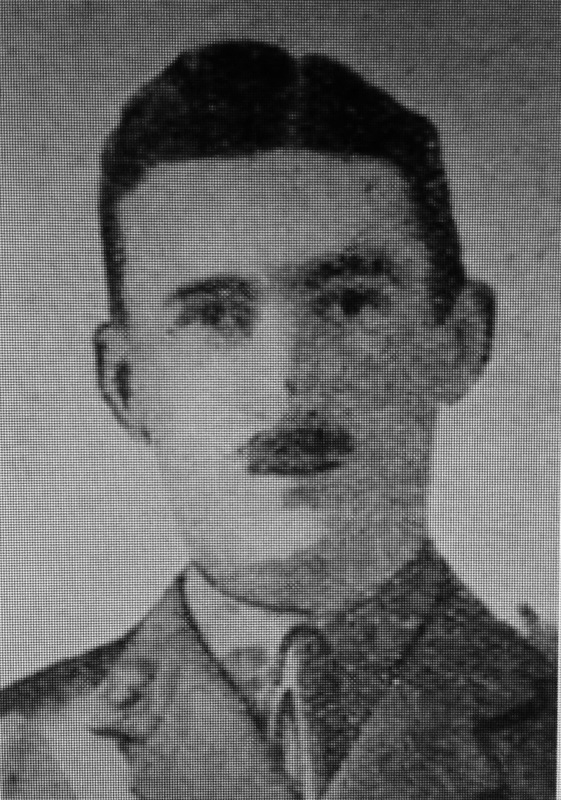 It is noted that another brother Bruce Harold Lord Macpherson also enlisted in May1918. 3. A great deal on the family and connected Ancestry is available, if any assistance is needed please email and only to happy to help. 4. Gordon Dump Cemetery is 2 kilometres north-east of Albert, on the right hand side of D929 Albert-Bapaume. At Y junction (102nd Infantry Brigade Memorial) nearby the Routiers restaurant, turn right onto D20 and follow through Ovillers/La Boisselle. After 2 kilometres the Cemetery is signposted onto a 300 metre grass track. Plot I of the Cemetery was made by fighting units after 10 July 1916 and closed in September when it contained the graves of 95 soldiers, mainly Australian. It was called variously Gordon (or Gordon’s) Dump Cemetery or Sausage Valley Cemetery, from the name given to the broad, shallow valley that runs down from it to Becourt. The remainder of the cemetery was formed after the Armistice when graves were brought in from the 1916 battlefields immediately surrounding the cemetery. There are now 1,676 Commonwealth servicemen of the First World War buried or commemorated in this cemetery. 1,053 of the burials are unidentified but there are special memorials to 34 casualties known or believed to be buried among them.